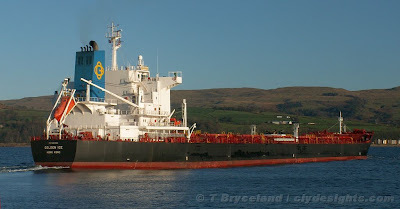 Seen heading into the Hunterston Channel, the Panamax bulk carrier GOLDEN ICE was carrying a cargo of coal from the northern Russian port of Murmansk. A new ship, only delivered at the end of 2008, GOLDEN ICE was built in China for the Golden Ocean Group. She has a deadweight of 75.500 tonnes, and is 225 metres overall. She is managed by Singapore-based Thome Ship Management.